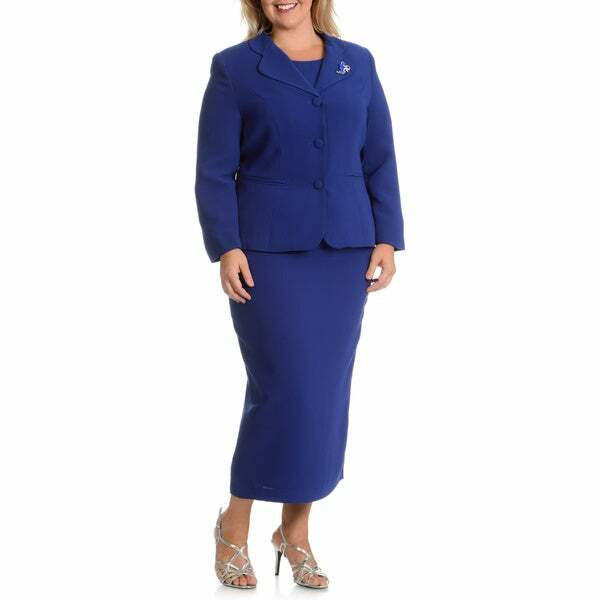 Make a lasting impression in this 3-piece skirt suit set. Featuring a 3-button jacket with rounded notch lapel, this outfit has amid-length skirt and sleeveless top included to create a cohesive, beautiful look. This is a beautiful suit! It looks even better in person! The fit was true to size. Very slimming even if you have some extra lbs. The suit is tailored & I feel beautiful in it! The skirt is long, almost a maxi, but not quiet! On me as I am 5'4, it's long, but I love long skirts. Its between my knee & ankle, so not quiet a maxi. Looks great w heels or boots! It's very comfortable also! I was sceptic st first as I'd never bought anything from Overstock.com. I will be be doing more shopping w Overstovk.com as I am very pleased w this suit! It looks great for church, business meetings, or if you happen to work at a high end department store! Or anywhere you want to impress someone! #verypleased! Best place for plus size suits, this looks very nice. I wash in cold water and hang to dry, perfect. The suit was true to size and the quality of the suit holds up when dry cleaned. This soup was absolutely gorgeous true fitting to 2 size I will recommend your product to all of my friends and family. I am very pleased with this suit. I love the texture of the material, the fit, the length, and the color. Lives up to its looks. Wore it Sunday received a lot of complements. This suit runs a little smaller in fit than I thought it would. I hope that it won’t shrink if I decide to launder as opposed to dry cleaning it. The suit is very adequate for the purpose I bought it. It could use a little more tailoring in certain spots but an overall good value. The color is rich and is holding up well. Very appropriate for the event I attended. I like this color,hope to get more suits in the future ,if you have my size. Looking for a blue suit for Agent Carter Halloween costume but wanted something I could also wear to work. I liked the machine washable fabric, and the color.